A “GOTHTOPIA” tie-in! Luke Fox has never been happier in his life. He’s tearing up Gotham City as its protector, and his father, Lucius, couldn’t be prouder of him. How did THAT happen? Story– Scarecrow has managed to produce mass hallucinations across Gotham City. In this ‘world’ Gotham is a paradise, Luke is no longer a vigilante, Batman went crazy at some point and Luke and his dad are closer than ever. Our hero manages to ‘break out’ of said hallucination and do the same to his family. In the underground his former friend Russ (Last seen in Batwing #25) has managed to carve out an empire for himself and plans to make Luke suffer. He is assisted by a man who can commune with Vermin. Back at the Fox residence Tam goes mission and Luke and his father try to track her down. Elsewhere she has been taken hostage by ‘Rat Catcher’. Family– Big Daddy Lucius Fox is here and giving Batwing the grill by way of fifty questions. His little sister steals the show though with her quick wit, precociousness and charm akin to Rudy Huxtable of the Cosby’s. 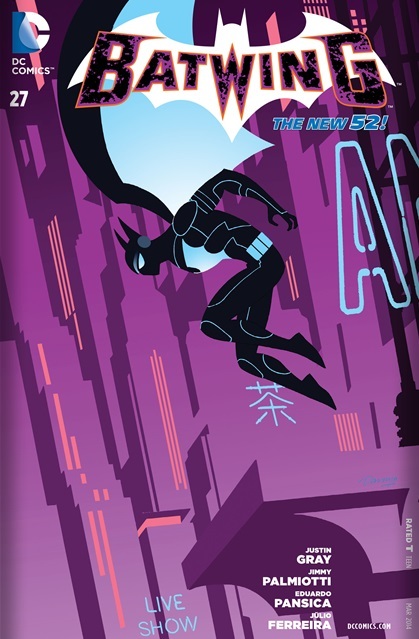 Cover– The minimalist approach looks good and makes sense from a business standpoint for DC Comics since Batwing’s sales are not so hot (See them here). Villains– Rat Catcher is a deliciously psychotic mix of Marvel’s Vermin and Batman’s Mad Hatter. He also manages to exude the grunge of Grant Morison’s Professor Pyg. It’s an interesting mix and hopefully his execution is as cool as his concept. Russel Tavaroff meanwhile has the makings of Batwing’s ‘big bad’, that all will depend on his execution as well. I like his illustration and his origin (detailed in Batwing #25) but have to wait and see if he’s worthy of that title. Black Hero– Luke Fox is front and center while showing that he’s a big brain like Bruce Wayne/Batman and Tim Drake/Robin before him. He’s managed to work his way into the bat family on a functional level unlike the distant David Zavimbi ever did, that is a good thing! The art will not please everyone.